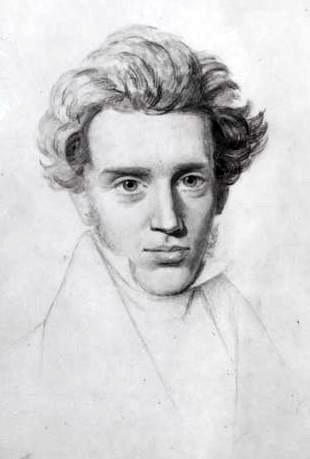 One of the most fascinating thinkers of recent times is Soren Aabye Kierkegaard (1813-1855), the Danish philosopher and theologian often called “the father of existentialism.” I first discovered Kierkegaard while studying abroad in Britain in the fall of 2005, and was immediately drawn to him and began devouring his books. Once I was back in the states, I took two classes on him as I was finishing up my philosophy degree in college. Of extra-biblical writers, only C.S. Lewis has done more to shape my thinking, and no other personality in history except Christ has gripped me so poignantly. Reading his biographies and books during that time in my life was like walking into a new universe: it opened up entirely new ways of thinking and challenged all my previously held assumptions. Kierkegaard, however, is one of the most misunderstood intellectuals of all time. Even competent philosophers misunderstand the dual nature of his authorship (for example, the contemporary popularizer of philosophy, Walter Kaufman, fails to even distinguish between his pseudonymous works and his signed works, leading to disastrous results), and the vast majority of evangelical Christians either completely ignore him or absorb Francis Schaeffer’s caricature (I have tremendous respect for Schaeffer, but it seems to me that The God Who Is There sometimes simplifies and caricatures the positions it is attacking). The most common criticism of Kierkegaard is that he is an irrationalist, i.e., that he denies that reality (truth) is objectively true and operates according to rational principles. However, a more careful reading of Kierkegaard demonstrates that he does not question the rationality of truth per se, only of truth as it is perceived by “the individual” (i.e., a finite and temporal person living in a fallen world). In Kierkegaard’s thought, truth is rational, but it must be subjectively appropriated by the individual, not because the truth itself is subjective, but by virtue of the individual’s subjectivity. For all his talk of the truth as paradoxical, once the individual is taken away, so is the truth’s paradox. Hence Kierkegaard’s famous dictum, “truth is subjectivity,” ultimately expresses an epistemological rather than an ontological claim. By analogy, the fact that dogs cannot see colors does not mean the world is black and white: the defect is in the subject, not the object. In future posts I hope to discuss Kierkegaard’s faith and life at more length. I have to disagree with you on one point. Kierkegaard is read carefully by many evangelicals. Perhaps, not as much in the US as in Canada and Britain (and also in Germany and the Netherlans). In the US, Kierkegaard seems more read by what might be termed the Post-Liberals and also some “emerging” thinkers. This is a great article, nicely done!